And next week, Matos will finally know what it feels like to be on the other end of those boxes. Matos, the service manager at Hoffman Audi in East Hartford, is leading an expedition to the island of his birth on Nov. 4, when he and four of his colleagues will personally deliver donated supplies to victims of Hurricane Maria. Over the course of the past few weeks, Hoffman employees sent Matos pallets of supplies for their friends and families. Bottled water and canned food, obviously, but also medical supplies, gas generators and solar lights. They sit in the dealership, each box bearing handwritten names and addresses of their recipients. The Hoffman family donated the expenses for two shipping containers that will begin their 10-day journey Tuesday. Those supplies will be joined by a chunk of the 400,000 pounds of goods collected by Peter Mercado and his Los Amigos softball league. 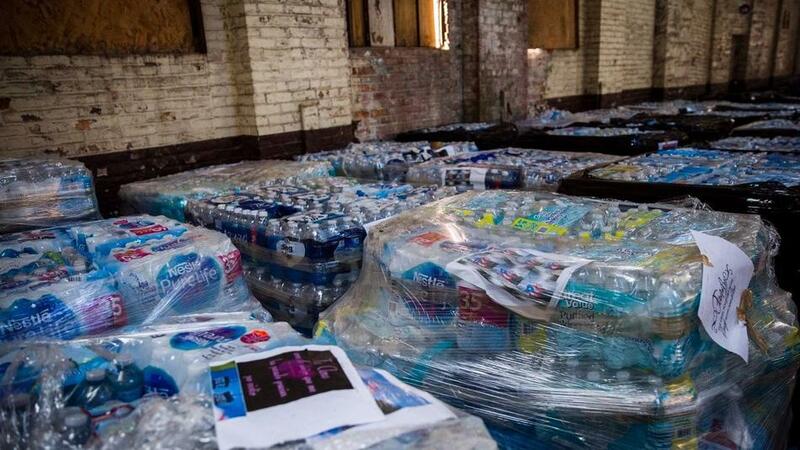 Currently, those goods are stranded in Coltsville, inside warehouses donated by the arms manufacturer. “It’s a big help,” Mercado said Monday, adding that Matos’ shipment will take about 50 pallets of his supply, including all of his food and a sizable chunk of his bottled water. Through his diligence, Matos made arrangements to store the goods in a furniture warehouse on the island, his base of operations. From there, his crew will visit 24 stops, some 100 miles apart on roads greatly damaged by the storms. Matos has the route tacked to a map above his desk, red push pins demarcating areas of need: Utuado, Orocovis, Morovis, Jayuya — towns in the heart of the island, far from the major metropolitan areas that get all the attention and resources. Part of that personal touch includes something he believes is more valuable than a warm meal or a dry towel — peace of mind, delivered through two satellite phones the crew is bringing with them. Matos is due to return Nov. 12. In the meantime, he’s hoping to continue the fundraising efforts that have, so far, netted enough to furnish a third shipping container. His goal is to keep chipping away at the stock Mercado has in the city’s Sheldon Charter-Oak neighborhood.